This is a fun one – a hoodie that pulses mini-LEDs in the hood in tune to your music. This proof-of-concept was for an ITP winter show and folks loved it. It’s 100% geek bling, but we had *lots* of kids asking when they could buy one and what colors it came in. The Hoodlüm “pulses” light in tune with the music that the wearer is listening to, be it the slow beats of a sonata or the sharp staccato of techno-jungle. Alternatively, the wearer can change modes to enable the Hoodlüm to pulse in response to the sounds around him, whether in a dance club or a subway. Finally, the Hoodlüm can be switched off and look and function exactly like a “normal” garment. The result is increased control over the relationship between the wearer of the Hoodlum and the fellow participants of his urban context. In the city, concepts of personal space and control are deeply compromised by the limitations of our urban environment. A plethora of means are employed to designate the border between ourselves and others. The hoodie as garment is an excellent example of this, being simultaneously synonymous with urban lifestyles and with hiding and/or covering oneself. Often paired with sunglasses and headphones, a hoodie with the hood up makes a clear statement that you are closed off to the people around you, both practically (as the wearer can’t see or hear you well) and psychosocially. Despite this, the fact remains that a person in a hoodie is part of a group and participates as such. In practice, a hoodie merely limits how the wearer interacts with others. It is the goal of the Hoodlüm project to exploit this limitation to enable and emphasize the channels of communication which the wearer enjoys control over, in this case the pulse of their music and/or the sounds of the world around them. 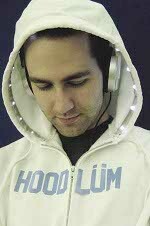 The Hoodlüm consists of three separate components; the hoodie, the light strips, and the control unit. A fourth component, the music source, is provided by the wearer and can be anything to which a normal audio jack can connect (a iPod, diskman, radio, etc.). Our hoodie was provided by Neighborhoodies.com, increasing the degree of personalization available to the wearer. Neighborhoodies allows you to “customize clothing and accessories to say anything you’d like.” More information is available at www.neighborhoodies.com. The light strips are custom-designed surface mount LEDs connected by conductive thread and sewn directly into the garment. Because these strips are washable, the hoodie can be washed normally. The control unit is a custom circuit series designed to sit parallel to the wearer’s music source in the hoodie’s front pocket(s). In this prototype the components are housed in a walkman, but we’re currently pursuing outsourced manufacturing of a miniaturized model. In all likelihood this future version will be extremely small and may be made to mount directly to the music source. For example, we could make an iPod control unit which has a mounting bracket to seat a specific iPod (such as a Mini, or a Shuffle). Update: Looks like the smart folks at Electric Movement took this idea all the way to market – nicely done!! !